NZXT M59 Makes Upgrading Easy | OhGizmo! By Chris Scott Barr on 07/22/09 • Leave a comment! When I’m building a new system, be it for myself of someone else, I consider each component very carefully. The ultimate goal is to select parts that will provide the best performance for the buck. When it comes to the case, you want something that can accommodate all of your components (with some room for future upgrades), keep them cool, look good and still be within budget. The new M59 mid tower from NZXT looks as though it should fit each of those criteria. 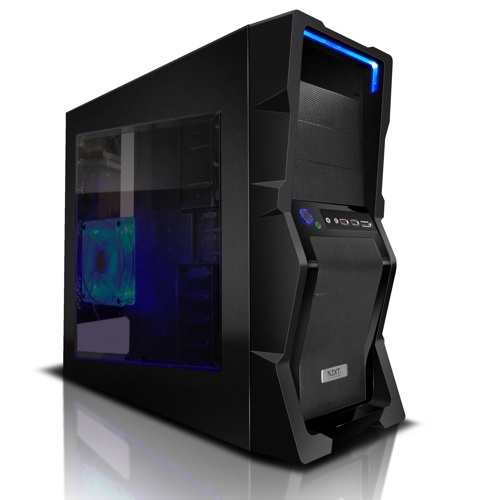 The feature list for this case looks a lot like some of the other NZXT offerings, which have impressed us in the past. You’ve got 5 fans for airflow, including optional side and top-mounted 120mm fans. Like most of NZXT’s cases, you’ll find pre-drilled holes for mounting a liquid cooling solution. The mesh front and overall look are probably enough to sell the case to most people, but there are two features that I’d like to point out, that should really make you think long and hard about upgrading your case. SSD’s are becoming more and more popular these days, especially with gamers. They’re still a bit pricey, but they can add that extra bit of performance that you’re looking for. Unfortunately, when you go to install one in your current system, you’ll quickly remember that you have nowhere to mount it. The guys over at NZXT were smart enough to see this issue, and included two 2.5” drive bays for just this reason. Again, thinking about upgrades, if you’ve installed a liquid cooling system you’ve probably had to deal with taking the motherboard out of the case. This is because you generally need a special bracket on the backside of the board. Once again the M59 has you covered. The area behind the CPU is left open on the case, covered only by the side panel. Your board will still be securely fastened to the case, but now you only need to remove the side panel to change out a mounting bracket. Very classy. You’ll be able to pick this case up next month for just $60.